What Does It Really Mean to Be Honest? To honestly assess information, we need to fully inform ourselves. 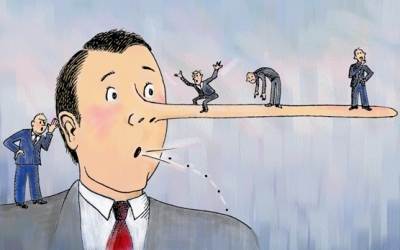 We have all heard ‘honesty is the best policy’ and, ‘you shouldn’t lie’, but what is honesty at the deepest level, and why is it so important? Honesty, at the deepest level, is a form of integrity. Integrity asks you to be spiritually courageous, and involves using your wisdom and discernment even in the face of great pain. Being honest is not always easy. Sometimes being honest means moving away from the comfort of beliefs that we hold great stock in, beliefs which we have been taught over a lifetime, beliefs which inform our our daily lives, actions, decisions, and relationships to a profound degree. The truth is, none of the comfort or emotional well-being derived from any belief is indicative of its truthfulness. There is simply no connection between what provides comfort and what is true. Believing things which are untrue can be very harmful, even though we may derive enormous personal comfort from the familiarity and promises of these beliefs. If someone comes to your door and explains that they believe something without providing charitable counter-arguments, alternatives, or competing explanations, then this is a very strong indication that that person is not acting in their integrity, their honesty. An evangelist will stand at your doorstep and faithfully show you everything that they believe, including why it makes sense to them, and the path they have taken to arrive at those conclusions. If they present you with any material that entertains a competing explanation, such as another very different religious system, it will always be used to show that other explanations are false. This is a very, very important point, because this is how we discover whether someone is acting in their integrity or whether they are deluding themselves or others. For example, a Jehovah’s Witness will not charitably discuss the merits of Catholicism or Islam, regardless of how many believers there are in these faiths worldwide. Other belief systems will only be referenced in passing in order to show that they are mistaken relative to the interpretation of the evangelists’ own religious commitments. A missionary does not go into the jungle to deepen his understanding of tribal spirituality, at least, not intentionally. He goes in order to persuade others of his culture’s views which he assumes to be superior prior to any philosophical comparison. Now, again imagine you are an Evangelical Christian and a Muslim comes to your door behaving in precisely the same way as you might. They offer you only an explanation of how Islam is exclusively true and holds spiritual superiority over other faiths. They will not hold competing faiths, including your own, in a favourable light, nor will they provide any charitable explanation of how these work, or the benefits they provide people with globally. In short, they are not acting out of integrity. Let’s go back to why honesty and integrity are important. If you are not genuinely honest about your beliefs and why you believe them, then the relationship of those beliefs to reality will be muddy at best. If we do not allow our beliefs to conform to the best available reasoning and evidence, then our worldview is at risk of stagnating for lack of congruence with reality. Just think what this would matter to divinity – I am not speaking of religion, but of divinity itself that people on earth should not act upon their integrity. This divinity may not take offense at having been wilfully misunderstood, but it would surely not condone people believing falsehoods without question and not honestly considering different answers, particularly if those false beliefs were harmful to others. A Baptist who comes to your doorstep to preach about the bible has nothing glowing to say about the Koran, the Talmud, The Upanishads or the Bhagavad Gita, irrespective of how valuable these may have been to millions of other lives over thousands of years. The reason for this is clear – once people believe they have found answers that suit them, they tend to stop considering the legitimacy of other explanations, and feel justified in confidently discounting the validity of those worldviews without feeling the need for further analysis. This is not a Christian problem or Jewish problem or a Muslim problem or an atheist problem – this is a human problem. When a politician comes to you, whether on television or in person, he isn’t telling you why his competition are wonderful and can help you in your life. He comes to you because he wants your support, he wants your vote. Your belief in his policy is a kind of transaction to him. In fact, it usually does not even matter to him that his policy should make you or your children’s lives any better. All that matters to him is that you vote for him. It is the same with religion. There are other important reasons that people once deciding upon a belief system do not carefully and charitably explore alternative explanations, and this is because of something called cognitive dissonance. If you already believe something, particularly if you have believed it for a long time and/or these beliefs inform much of what your personal life is built around, then there will be very strong resistance to changing or even questioning those beliefs, even if those beliefs have been harmful or false. If an animal in a zoo has been kept in captivity for its entire life, even though it may have been kept enclosed in cramped, uncomfortable conditions, then the world outside will seem terrifying, even the wild where it belongs. Its natural freedom will terrify it to the point where for the sake of its imagined comfort, it will choose to remain caged out of fear and the comfort of an abject yet familiar environment. We even limit our own children in order to indoctrinate them into our own views. This can be done in many ways, by limiting the friendships they have, monitoring the books they read, the movies they watch, or even schooling them ourselves, bypassing the perceived problem of our children receiving and understanding alternative ideas and explanations. Christians frown upon Muslims for doing this, and vice versa. If anyone was truly operating in their integrity, in respect for truth they would never limit their children in this way. Now, of course we all love our children, and of course we all do for them what we think is best. However, if we truly believed what we say we do, then we would allow our children the freedom of education that would naturally lead them to seek the truth, and if what we believe to be true was indeed true, then they would reach the same conclusions as we have. The fact that people force their own beliefs upon their children is a form of dishonesty. It is symptomatic of a lack of faith in one’s own beliefs and assumptions. Many religious parents, although somewhat uncomfortable with the inherent dishonesty of indoctrination, reason in the following way: “Yes, I am limiting their beliefs and freedom because I love them and I do not want them to be affected by evil, whatever the cost, because in my doing so I spare them from sin and damnation”. However, this is precisely the same reasoning that keeps other authoritarian religious traditions which you disagree with in business. If you are a Fundamentalist Christian, you disagree with Fundamentalist Muslim children not receiving a free education. Yet their parents reason in the same way that you do, only they consider that beliefs in departure from Islam lead to damnation, while you believe the same regarding Christianity. In honesty, you cannot have it both ways – either you agree that all religions should indoctrinate their children, or you believe that children should be allowed freedom to seek the truth. Questioning beliefs and assumptions costs energy. If we re-evaluate what we believe and why, then the resulting change can be very difficult, which is sadly why people, particularly those with strong beliefs, have a strong resistance to this. It is more important to most people to remain comfortable, in familiar territory, and amongst people who believe the same things than it is even to pursue the ultimate truth of reality, who they really are and why they are really here. They are afraid that if they question their beliefs, then they will betray their family, friends, church, tradition, culture, God. All that is actually happening is that that person is no longer putting comfort and familiarity first, and is now stepping into the courage and integrity to hold all of their beliefs subject to a rigorous questioning. People do this out of a deep respect for themselves, for others, for truth, and for divinity. Unfortunately, many see it as easier to die for their convictions than to live questioning them. To the extent that people do not do this, they choose to remain asleep. This is why we have traditions spanning thousands of years, and yet no peace to show for it. Violence, both physical and ideological, is rife, as is suffering, neurosis and fear of death, insanity and damnation, all despite the proclamation of great faith and righteousness. It is not loyalty that keeps you in chains, but fear. To value and practice honest questioning and integrity is to value spiritual awareness, to be awake to the truth in whatever form it may take. The time to remain asleep is over for those who choose to awaken and hold to question every assumption that separates us from our brothers and sisters. Simon P. Murphy is a Nelson-based writer. He is the author of the short story collection His Master’s Wretched Organ and the forthcoming Lexicanum Luciferium (both by VJM Publishing). His fiction is heavily influenced by Gnosticism and Alchemy, placing a central focus upon the theme of our navigation of an occulted reality through the use of archetypal symbolism.